Mike Cottrill has been writing professionally since 1995. He has written for periodicals including "The Cambridge Times" and "Woman's World." Cottrill's first novel, "To Kill By Mourning," was published in 2004. He studied journalism at Conestoga College in Kitchener, Ontario and holds a Bachelor of Arts in sociology and physical education from York University in Toronto. The rate at which your heart beats during exercise is an excellent indicator of the intensity of the activity. Monitoring your heart rate helps you determine if you are working hard enough to burn fat or if you are working too hard -- which reduces fat burning. Both men and women's bodies operate in the same manner: to burn fat you need to exercise within your training zone. A man's maximum heart rate is his age subtracted from 220. The minimum training heart rate that burns fat to fuel your muscles is 60 percent of your maximum heart rate. Find your minimum heart rate by multiplying your maximum heart rate by 60 percent, or 0.60. The longer you exercise in your minimum heart-rate zone, the more fat you burn. Exercising within your training zone, 60 percent to 70 percent of your maximum heart rate, allows your body to burn fat and your muscles to re-energize with glycogen, according to Brian Mac. When you exercise within your training zone, you maximize fat burning within a given time frame. Besides monitoring your heart rate, you can also assess your exertion level by the following signs: Is there a burning sensation in your muscles? Are you gasping for breath? When you exceed the training zone, lactic acid forms in your muscles, causing a burning sensation. Fat utilization by your muscles is greatly reduced as your muscles turn to glycogen for fuel. When you experience the lactic-acid burn, you have entered the anaerobic zone of 80 percent to 90 percent of your maximum heart rate, and reduced fat burning. The aerobic equipment at most fitness facilities has sensors that can be used to monitor your heart rate. However, if you don't have access to this equipment, a quick and easy way of figuring your training intensity is by taking your pulse for 10 seconds and multiplying that number by six. The most convenient areas for taking your pulse is on the wrist or at the throat just below the back edge of your jaw. Warm up for 5 minutes before you begin the aerobic phase of your workout. While engaged in aerobic activities, check your heart rate from time to time to ensure you are working within your fat-burning zone of 60 percent to 70 percent of your maximum heart rate. Do not stop moving while monitoring your heart rate, but continue to walk or move around. 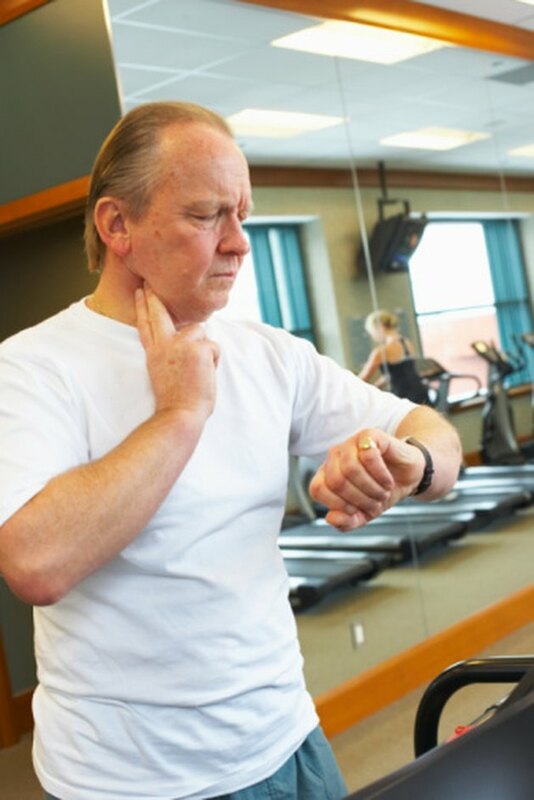 To lose fat, exercise for 30 to 60 minutes in your training zone. Cool down at the end of your session with several minutes of low-intensity exercise. Include static stretches to remove any lactic acid buildup. Do I Burn Less Fat if My Heart Rate Is Too High While Exercising?